Read more Pew Research Center findings about how social media is being used in the United States and around the world. 3Facebook is popular among all demographic groups, though some adults are more likely to use it than others. Nearly three-quarters of women in the U.S. (74%) use the platform, compared with 62% of men. There are differences by community type and education level, too: Adults in urban areas are more likely to use it than those in suburban or rural areas, as are those with a college degree when compared with people who have lower levels of education. Around eight-in-ten (81%) of those ages 18 to 29 use Facebook – about twice the share among those 65 and older (41%). However, the share of older Americans who use the platform has doubled since August 2012, when just 20% of those 65 and older said they used it. 4 Facebook is used by around half of America’s teens, but it no longer dominates the teen social media landscape as it once did, according to a survey of U.S. teens conducted in March and April 2018. Now, 51% of those ages 13 to 17 say they use the platform, down from 71% in a 2014-2015 survey. The top sites among today’s teens include YouTube (85%), Instagram (72%) and Snapchat (69%). In the 2014-2015 survey, Facebook was the only platform used by a clear majority of teens. 5Lower-income teens are more likely than higher-income teens to use Facebook. 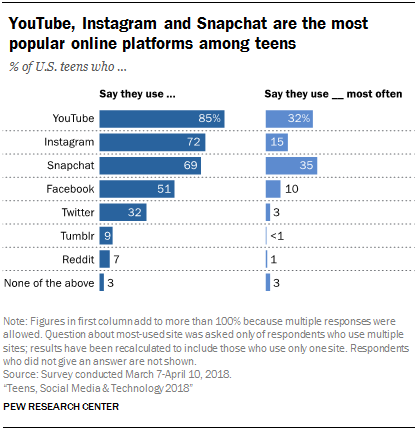 U.S. teens generally use similar social media platforms regardless of their demographic characteristics. When it comes to Facebook, however, seven-in-ten teens living in households earning less than $30,000 a year say they use the platform, compared with 36% of those whose annual family income is $75,000 or more. 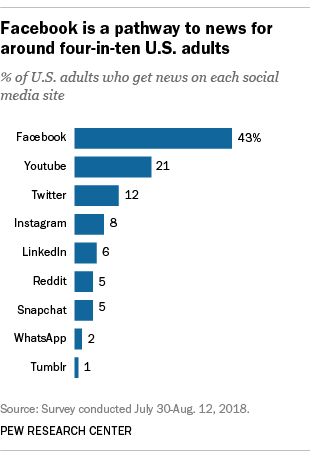 6 Around four-in-ten U.S. adults (43%) get news from Facebook, according to a survey conducted in July and August 2018. 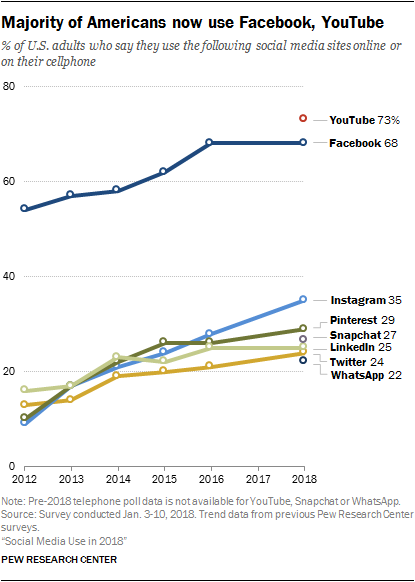 The share of U.S. adults who get news through Facebook is much higher than the shares who get news through YouTube (21%), Twitter (12%), Instagram (8%), LinkedIn (6%) and other platforms. Among U.S. adults who get news from Facebook, women are more likely than men to do this (61% vs. 39%), as are whites when compared with nonwhites (62% vs. 37%). 7 Many adult Facebook users have altered their use of the platform. 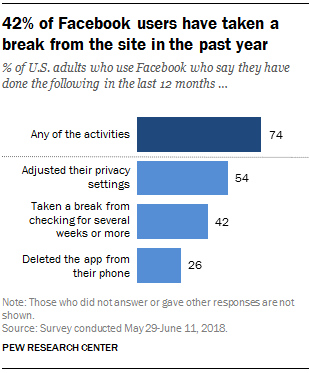 A little over half of adult Facebook users in the U.S. (54%) have adjusted their privacy settings in the past 12 months, according to a separate Center survey conducted in May-June 2018. The survey followed revelations that former consulting firm Cambridge Analytica had collected data on tens of millions of Facebook users without their knowledge or permission. About four-in-ten adult Facebook users (42%) have taken a break from checking the platform for several weeks or more, and about a quarter (26%) have deleted the app from their phone at some point in the past year. Combined, 74% of adult Facebook users say they have taken at least one of these three actions. 8Many adult Facebook users in the U.S. lack a clear understanding of how the platform’s news feed works, according to the May-June 2018 survey. Around half of these users (53%) say they do not understand why certain posts are included in their news feed and others are not, including 20% who say they do not understand this at all. Just 14% of Facebook users believe ordinary users have a lot of control over the content that appears in their news feed, while twice as many (28%) say users have no control. A 57% majority of Facebook users say they have a little control over what appears in their news feed. Around six-in-ten Facebook users (63%) say they have not intentionally tried to influence or change the content that appears on their news feed. 9 Around three-quarters of Facebook users are not aware that the site lists their traits and interests for advertisers. Facebook makes it relatively easy for its users to find out how the site’s algorithm has categorized their personal traits and interests for advertisers: This information can be accessed via the platform’s “Your ad preferences” page. But 74% of adult Facebook users in the U.S. were not aware that the site collects this information about them until they were directed to this page as part of a Pew Research Center study conducted in September and October 2018. 10The fact that the company maintains a list of users’ traits and interests makes many users uncomfortable. Once directed to their ad preferences page, around half of adult Facebook users (51%) said they were not comfortable with Facebook maintaining this kind of list, according to the same study. And while a majority of users (59%) said the categories produced by Facebook reflect their real-life interests, around a quarter (27%) said these classifications are not very or not at all accurate.